When To Harvest Vegetables For Peak Flavor? Share the post "When To Harvest Vegetables For Peak Flavor?" We need to learn how to grow vegetables and we also need to to know when vegetables in our garden are ready for harvesting. 🙂 You might think that harvesting vegetables is a simple task. With some vegetables this is quite true. For example, with tomatoes (by the way, tomato is classified as a fruit but not a vegetable, but we’ll leave it here in this article as many of us consider tomato a vegetable), it may be easy to tell when fruit is ripe, but with some other vegetables determining the optimal time to harvest them may be not so easy. It is recommended to harvest vegetables when they are at their best — the most tender, the sweetest, and the most flavorful. If not picked at the right time, some vegetables become seedy, stringy, woody, and/or tasteless. Considering all the hard work you already put into planting and caring for them, this is not the wise thing to do. 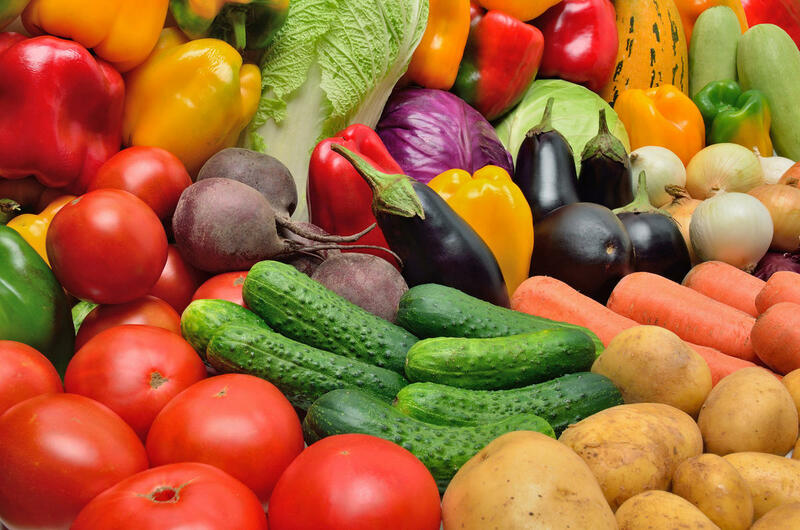 Many factors affect flavor in your vegetables: soil type, temperature, season, seed variety, amount of water, sunlight, and whether they are grown outdoors or in a greenhouse. At harvest time, however, the most important things to consider are time of day, and ripeness. Vegetables are best harvested in the cool morning hours so that they store longer and stay crisp. If harvested too late, they become limp and wilt quickly, having evaporated much of their moisture and absorbed the midday heat. This is especially important for leafy greens like lettuce, chard and fresh herbs such as parsley and basil. It also applies to crisp fruiting vegetables like peas, and anything in the cabbage family like broccoli and radishes. Tomatoes, peppers, carrots and zucchini are less sensitive to wilting, so they can be picked later in the day (of course also better not in the heat but in the evening hours). There are no precise guidelines for when to harvest your vegetables, but there are some rules of thumb to guide you. Most vegetables are harvested just before full maturity, for maximum flavor. TOMATOES: Tomatoes get full flavor when they are richly colored. (Some varieties of tomatoes produce yellow, orange or brownish fruit). Tomatoes should be harvested when fully vine-ripened. If overriped, tomatoes lose their firmness fast. You can expect a full red color to develop about 5 to 8 days after the first signs of pink show on the fruit. If you are experiencing unfavorable weather (for example, alternately wet and dry) and are concerned about cracking of thin-skinned heirlooms, pick them when they are just blushed with color and let them ripen indoors, but don’t put them in the refrigerator. Tomatoes taste best when days and nights are warm, but where nights are cool or not enough sun during the day tomatoes might taste bland. CORN: When the ears become rounded at the base and the silks at the top turn dark brown but haven’t yet dried out, your corn is ready. Test the maturity by peeling down the husks to expose the cob and puncture a kernel with your fingernail. If the kernels are fat and juice is milky, the corn is ready to eat. If the juice is watery, you should wait one or two more days. If the juice is thick, the corn has gone starchy, so better use it as creamed corn or in chowders. The milky kernels only last for a few days so do not delay harvesting. Once cobs are picked, they immediately start changing sugars into starches, especially in warm temperatures. Therefore, after picking the cobs, cool them as quickly as possible. CUCUMBERS: Harvest cucumbers on a daily basis or at least every other day, this will encourage continuous production. Don’t wait too long, since overmature cucumbers turn yellow, form a tough skin and have tough seeds. Cucumbers should be picked when they are still green and firm, and the seeds are small. Don’t leave mature fruit on the vine. Proper harvesting size is determined by intended use, smaller ones for dill pickles and longer for slicing. Harvest lemon cucumbers when they are light green with just a blush of yellow, because when they turn bright yellow their taste is less crisp and they have lots of seeds. EGGPLANT: Pick eggplants when they are large, firm, smooth and shiny, with an even deep purple color. Slightly immature fruits taste best, before the skin become tough and seeds mature and become dark inside (eggplants with brown seeds past the edible stage). Harvest mature eggplants and plants will produce over a long period of time. Better cut rather than pull. To determine if the fruit is mature, press the side of the fruit slightly. If the indentation remains, the fruit is mature. BELL PEPPERS: Green bell pepper varieties are usually picked when they are fully grown and mature, firm and green, but they may be harvested green and immature. Sweet peppers taste much sweeter and are most nutritious when they’ve been allowed to fully color up from green to glowing red, orange or yellow on the vine, depending on variety. When the fruits are mature, they break easily from the plant, but anyway it would be better for the plant to cut them off rather than to pull off. Some (light yellow, lilac and purple) are colors that develop in the immature fruit and that should be harvested before actually ripening, when they turn red. If there is no chance for your peppers to ripen completely, you can pick them as late as possible and keep in a cool place to color up, but check them often for rotting. CHILE PEPPERS: Hot chile peppers are usually picked when they are red and develop full pungency and fruitiness, but “green chiles” (the immature fruits) can be harvested as well as soon as they’ve grown to size. You can pick individual chilies or also entire plants can be pulled in the fall before the cold weather and hung to dry. Be careful when handling hot peppers, because skin, nose and eyes may become painfully irritated. Use gloves when picking or handling chile peppers. ONIONS: For large storage onions, wait until tops have ripened and fallen over. Harvest and allow the onions to dry in the sun. Cut off the tops and shorten the roots when the skin and tops are completely dry. Store them in a cool, dry, airy place. You can also pick young scallions. GARLIC: When the garlic tops will fall over and begin to brown the garlic is ready. Don’t pull it but dig, and allow to dry before storing. Simply brush off the dirt, don’t wash.